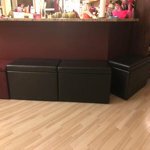 Permanently resolve storage and seating shortages using the Better Homes &amp; Gardens 30 Inch Hinged Storage Ottoman. This multifunctional unit is the perfect choice to help you make the most of your living space by acting as both a storage container and a comfortable ottoman or footrest. The hinged construction allows you to easily open the top and store any and all belongings inside the body cavity. Tuck books, blankets, games, toys and other accessories inside so they are close at hand but remain out of sight for a neater space. Then, close the top and take a seat! The cushioned top will make for a comfortable seat or footrest whenever desired. And, the sophisticated brown finish will coordinate easily with your existing decor. It’s a no-brainer! Bring home the Better Homes &amp; Gardens 30 Inch Hinged Storage Ottoman today and make sure you always have a place to tuck away the essentials where guests can sit and relax as needed. Permanently resolve storage and seating shortages using the Better Homes & Gardens 30 Inch Hinged Storage Ottoman. This multifunctional unit is the perfect choice to help you make the most of your living space by acting as both a storage container and a comfortable ottoman or footrest. The hinged construction allows you to easily open the top and store any and all belongings inside the body cavity. Tuck books, blankets, games, toys and other accessories inside so they are close at hand but remain out of sight for a neater space. Then, close the top and take a seat! The cushioned top will make for a comfortable seat or footrest whenever desired. And, the sophisticated brown finish will coordinate easily with your existing decor. It’s a no-brainer! Bring home the Better Homes & Gardens 30 Inch Hinged Storage Ottoman today and make sure you always have a place to tuck away the essentials where guests can sit and relax as needed. Fabric Care Instructions: Spot clean with a damp cloth. Perfect to store my busy preschooler's toys while blending perfectly with my living room decor. Love that the hinges keep it open so I don't have to worry about it falling on us and stays open for quick easy clean up. Get it before it's out of stock- AGAIN! I needed a storage with hinged lids to prevent my daughter from closing the lid on her fingers- this is a small perfect size for her toy box! Get them while you can, I've waited over 5 months for this to come back in stock. Also you can sit on them with no problem - I'm 230lbs and it holds me with no issues! I needed an ottoman long enough to go in front of my long love seat that would hold blankets and pillows for afternoon nappers (my family) when they visit. 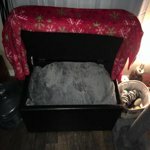 This is perfect....I love the size and that it will stay open while you are picking out a blanket and pillow, but that it isn't so large to be intrusive. I DO recommend this! We love it!! Just as described. A lot of storage, more than I expected. Came very well packaged. It was for my daughter and she loves it. I actually use it for our shoes right next to the door so we sit on it take up for shoes or shoes inside and it's perfect keeps my floors clean. I absolutely love it. Love it. Nice light grey color. It's great for the price I paid. You wouldn't find this at Homegoods etc. Storage is just enough for storing spare throws. 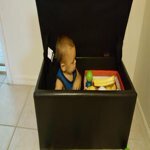 Hey Catherine, thank you for the wonderful review of this Better Home and Gardens Storage Ottoman. I'm so glad that you're happy with your purchase! Thanks for checking out Jet.com. Just a couple reasons why I love my ottoman. Love the fact that all my clothes fits perfectly inside at the foot of my bed and doubles as a great seat for putting on socks and shoes in the morning lol. The only drawback is cats love to kneed on the leather so be weary of cats that have not been declawed. This item has been returned. When I picked it up from site to store I was startled by the color. Decided I'd at least give it a try by my dark brown leather couch. Nope! Not even close to a dark brown!! It looks like BLACK!